1) Inoculate cells overnight so that they are ready for the next day in YE media. 2) The next day, check OD of grown cells (ideal OD is 0.2-0.4). Use ~50ml per transformation. 3) Spin down cells at 3000 rpm for 3 mins in 50ml falcon. 4) Wash with 50ml ice-cold water and spin down, discard supernatant. 5) Repeat washes twice with ice cold water. 6) Resuspend cells in 5ml ice-cold 1M sorbitol and add 250ul of fresh 1M DTT. 8) Spin down at 3000rpm, 3 mins and discard supernatant. 9) Wash with 1ml 1M sorbitol, transfer cells to Eppi tube, spin down again to remove excess liquid. 10) In the meantime prepare transforming DNA (see footnote*). Use A LOT - we typically use ~5 micrograms if transforming with PCR products and at least ~1.5 micrograms when transforming with a linearized plasmid. We resuspend the DNA in 50ul of ddH2O after purification from column and then add 50ul of 2M Sorbitol so that the final concentration of Sorbitol is 1M and final volume is 100ul. Add 1ul of sonicated salmon sperm DNA. 11) Take the prepared DNA (final volume should be 100ul) and resuspend the cells with it. Incubate in Epp tubes on ice for 30 mins. Remember to chill the cuvettes on ice in the meantime. 12) Set electroporator at 2.30kV (see footnote**). Transfer the cells into the cuvettes, dry the cuvettes and place in holder. Pulse. 13) Add 1ml of 1M ice cold sorbitol to the cuvettes. 14) Prepare 50ml Falcons with 8ml of YES per transformation and add contents of cuvettes into each tube. 15) Loosely attach lid with tape. 17) Next day, spin down cells and plate onto 3 selective plates and wait 2-3 days for colony formation (see footnote****). *In our hands, plasmid-based targeting gives less false-positive clones at the genotyping stage. **As far as we know, the Niki lab uses 2.3KV, 200ohms, 25uF setting for electroporation. Our lab has an electroporator from Biorad (http://www.bio-rad.com/en-uk/product/micropulser-electroporator) that works well at 2.3KV for S. japonicus. We use 0.2 cm gap width cuvettes. ***Re: an overnight recovery step. We usually transform cells late in the afternoon - so that cells are not starved - before plating them on selection plates. Also, try plating cells at different densities to prevent over-crowding. 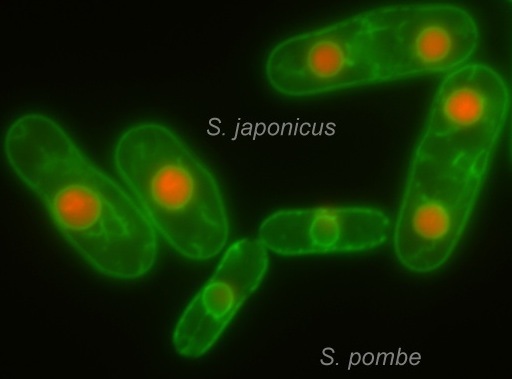 ****S. japonicus colonies do poorly post transformation at 30°C on G418 selective plates . We usually keep them at 24°C until transformants appear. However, Nat (Nourseothricin)-resistant clones do not have this issue.